Systematic reviews, analyses, peer reviewed papers, case studies, success stories, technical reports and grey literature…..
All these information and knowledge tools play an important role in helping countries improve their health research systems. But none of these – on their own – realizes the full potential to share relevant experiences and practical approaches across regions and countries, between actors in health research who need to know. COHRED is committed to improving the quality of learning and sharing for improved research for health. We have started by exploring a learning spiral approach. All interested partners are invited to interact around issues of improving research for health at country level. We see the spiral as a continuous consultation among interested players, with specific learning points, where interactions (papers, guidelines, etc.) are synthesized and published. After a synthesis or publication milestone, the learning spiral continues to advance and expand. So, where a traditional publication is often the end-point in a linear process, the ‘learning spiral’ approach encourages continued interaction and community building between health research professionals, to develop, capture and make useful information in a specific aspect of health research. Learning events include meetings and workshops, video conferencing, think tanks, blogs and other forms of on-line interaction. A learning spiral can create communities where all those interested in research for health (policy makers, professionals, communities, media, etc.) from many countries can get rapid answers to their questions. How they work? Who are they for? What are the benefits? 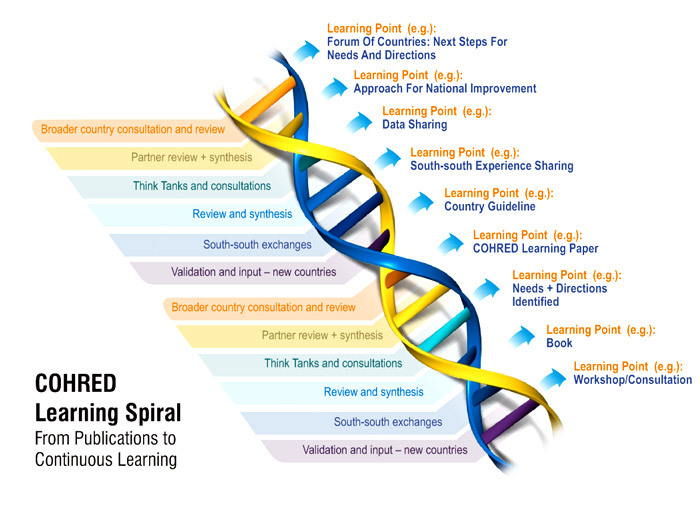 What is a learning spiral? Explore specific areas of research for health of concern to countries, with a view improving understanding or sharing experiences. Learning together around topics of mutual interest. Synthesize and disseminate useful information at specific points in the cycle. 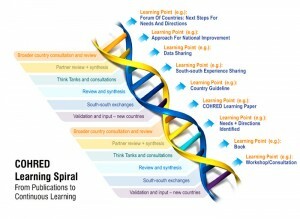 The concept of ‘learning spiral’ is used in education and organizational learning as an on-going process of interaction, learning and feedback.The format is flexible and adapted to specific needs of the group convened and topic explored. Where do these learning events occur? Learning points during the year may include telephone synthesis discussions (web and telephone conference). Opportunities for face-to-face interaction will be linked to regional meetings and COHRED sessions at the Global Forum annual meeting and similar events. Expert consultations (think tanks) are a part of the COHRED project management cycle, each year a number of topics are analysed as a part of the COHRED work programme with its country partners. With this learning spiral we will bring these interactions to a wider group of people. Is this a chat or forum? These are structured interactions to gain input, and perspectives (not consensus) around approaches for improving health research, the analysis of problems for solutions at national and regional level. We are starting with a simple web exchange approach, which will evolve (we are learning as we go!). Are these workshops or meetings? These are primarily on-line interactions aimed at building communities of practice to help research for health professionals in countries examine issues of importance to their progress. Each case will be different and the groups will seek opportunities for face-to- face meetings as useful and practical. Are you asking me to subscribe to a ‘COHRED agenda’? No. Initially, COHRED plays the role of convener and enabler for these discussions. COHRED’s ‘agenda’ is not linked to a particular approach, tool or doctrine on health research systems. It is to enable learning and increase the cycle of exchange of practical information between interested partners. Is this a club or closed shop to push certain views and approaches to research of health? Is there a peer review process for these interactions? Yes, but it is different from a typical peer review. As a part of these interactions, feedback and comment by peers is solicited and shared. Periodically, a formal review will be done at specific stages of the process, as with COHRED publications, National Health Research and Working Papers. The aim of this process is to learn more rapidly than is possible with the traditional analysis-review-publishing approach, and to involve many more people in learning together. Each interaction is structured around a group of experts on the topics examined, and convened by COHRED. Discussion on key issues identified for exploration will be opened to a wider group of professionals (anyone who is interested) for input and discussion. All interactions will be logged and saved. Interactions will be synthesized by the core group at appropriate learning points in the process. Here, the accent is on having an ongoing learning process and continued interactions, with publications as milestones along the way. The editorial approach is inspired by Wikipedia and other on-line sharing approaches which are gaining credibility in the academic and professional worlds. See recent study by Nature. All contributions will be acknowledged. The aim is not to own the body of expertise, but to offer a platform where practical expertise can be share and disseminated to everyone interested. Yes but this ‘on-line only’ approach is inequitable. Doesn’t it exclude people in developing countries who do not have access to internet? We agree. But it is also true that most of the real practitioners in countries never have the opportunity to attend international conferences and meet peers. So the learning spiral can become an important starting point for widening the circle of people who can participate in an interaction. Each group will include analysis on how to engage those without good web access. What is your advice? What approaches can involve people that are not usually invited? Please send the names of people without internet access who should receive this information.